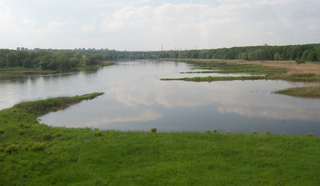 The Oder has, until recently, led a peripheral existence: a border river in the uttermost East of Germany, a border river in the uttermost West of Poland. The hundred year flood of 1997, but even more the profound changes in the political and geographical constellation since 1989 have moved the Oder, for an instant at least, into the centre of public interest. With Poland and the Czech Republic joining the European Union in 2004, the Oder region has become again a landscape in the centre of Europe. Dealing with the cultural area of the Oder region, marginalised for decades yet so rich, is not only overdue, but also possible in a new way: as a reading of two stories of a single region, as a deciphering of a complex and at times extremely traumatic history. Bringing this history to mind raises outstandingly interesting and difficult theoretical and methodological questions. Yet this only brings about was has been brought about for other cultural and river landscapes long ago: the recovery of the spatial dimension of historical and, above all, cultural-historical work. For well-known reasons, historiography on the Oder is discontinuous, falling, as it were, into two parts: one predominantly German (until 1945), the other predominantly Polish (after 1945). It is imperative to put both perspectives together and to continue exploring them on a new transnational level. The project “Odra-Oder. History, Present, and Future of a European Cultural Area” is intended to make a broad public aware of this topic. The opening event is an international Oder conference, which will take place from 27 to 30 April 2006 in Frankfurt on the Oder and Słubice. It will be flanked by the exhibition "Oder Panorama I Panorama Odry" on river perspectives from the cities along the Oder, which will be specially arranged as part of the project and be shown from 27 April until July 2006 in the Reithalle in Frankfurt on the Oder. In July 2006, the city of Frankfurt on the Oder is to host an “Oder-fair”, at which tourist projects by the river and relevant NGOs will present themselves.